Ring of polynomials over another ring. Definition at line 314 of file polynomi.h. 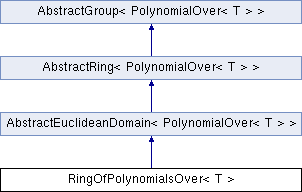 Implements AbstractGroup< PolynomialOver< T > >. Definition at line 327 of file polynomi.h. Definition at line 330 of file polynomi.h. Definition at line 333 of file polynomi.h. Reimplemented from AbstractGroup< PolynomialOver< T > >. Definition at line 336 of file polynomi.h. Definition at line 339 of file polynomi.h. Definition at line 342 of file polynomi.h. Definition at line 345 of file polynomi.h. Definition at line 348 of file polynomi.h. Implements AbstractRing< PolynomialOver< T > >. Definition at line 351 of file polynomi.h. Definition at line 354 of file polynomi.h. Reimplemented from AbstractRing< PolynomialOver< T > >. Definition at line 357 of file polynomi.h. Definition at line 360 of file polynomi.h. Definition at line 363 of file polynomi.h. Definition at line 366 of file polynomi.h. Implements AbstractEuclideanDomain< PolynomialOver< T > >. Definition at line 369 of file polynomi.h. Definition at line 372 of file polynomi.h.